I had the great good fortune to accompany Buckminster Fuller on his speaking tour of Southeast Asia in 1976. His impact on my life is immeasurable. Working out of a small basement studio in Raleigh, N.C. I began to construct tensegrities as art with the prospect of producing tables and useful designs (see Innovations in Structural Optimization). My subsequent explorations into the geometry of "Tensegrities" provided insights into the possibility that a "universal fabric" could be woven from wire and struts. And then, I proved myself wrong (that is, I abandoned the thesis for using the Tensegrity paradigm) and arrived at an entirely different solution that is elegant, economical, structurally stable, easy to produce and practical. I took a harder look at tension and compression. 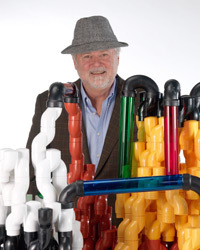 For 25 years I carried around the idea for a single repeating unit that was structurally stable, was connected to its neighbor, and was reduced in weight without sacrificing strength. I could no longer ignore my passion for the subject so began anew my exploration for a universal fabric not to be confused with the "Fabric of the Universe." First, I stacked octahedral tensegrity cells into a tensile array. However, this time I realized that the outline of the icosahedron formed by the tensile elements was actually the omni-axial compression element (or thinking differently, its inverse). Then I realized that the lines of tension could be created from strategically placed interconnecting elements, restraining the twelve degrees of freedom, producing discontinuous compression in a tensile matrix. I've spent the last six years nailing down the intellectual property (three patents), exploring different weave patterns and assembly techniques and understanding the basic structural elements of the array. And, oh in passing, this is not cheap stuff! The latest invention, the 'Floret' structure, still continues to baffle many. Its origins are in two, intertwined tetrahedrals, sometimes called the 'bowtie' crystal, that are formed by the three uppermost, central, and lowest three loci of the cubo-octahedral shape. Elizabeth B. (Beth) Freeman, Ph.D.
As part of the startup team with FlexBlox, Beth brings passion and expertise in all phases of business operations and strategy in the consumer products sector. 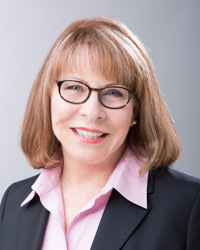 In addition to owning and operating several businesses, Beth has worked with numerous startups and established businesses as a management consultant, specializing in Strategy Design and Execution, Leadership and Organization Development. She holds her MBA and Ph.D. in Strategic Management from the University of South Carolina and has taught graduate, undergraduate and executive classes in strategy, management and entrepreneurship at TCU, Portland State University and University of Texas at Dallas. In addition to working with FlexBlox, Beth is adjunct professor of management in the School of Business at Portland State University. John W. Brady, an accomplished executive marketing leader, has deftly guided North American divisions of multinational companies through the competitive consumer goods landscape while enhancing brand development, product innovation, process improvement, and operating efficiencies. 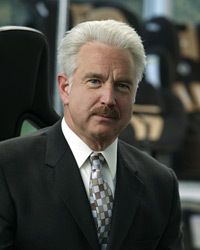 With decades of executive experience, Mr. Brady has held key roles at a variety of consumer products companies including C-level positions at RECARO Child Safety, LLC, Tecnitoys North America, Inc. (SCX), Lionel LLC, Fisher-Price, Inc., Casio, Inc., and a division of General Mills Inc. Mr. Brady currently oversees the marketing effort for FlexBlox. With a successful track record of launching promising product lines in both the mass distribution and specialty/collectibles market spaces, Mr. Brady has been able to drive new and incremental growth by targeting key areas of opportunity and recognizing consumer trends at their outset.